The title for this section is not meant to be misleading, but due to the fact that the initial story for the Green Goblin was a mystery identity, the villain's alter ego was intentionally hidden. Thus, the Goblin had been around in the Spider-Verse roughly two years (real time) before Norman Osborn ever made his debut in Amazing Spider-Man. And when he was finally introduced, it was not at all obvious that he was the Green Goblin as well. In the retconned stories like Untold Tales of Spider-Man, the Green Goblin is revealed to be Norman Osborn earlier in his character timeline. However, Norman's first recognized comic book appearance was in June of 1966 in Amazing Spider-Man #37. But before beginning the official synopsis, there are some unofficial occurences that are a part of the Spider-Man mythos and are worth mentioning. 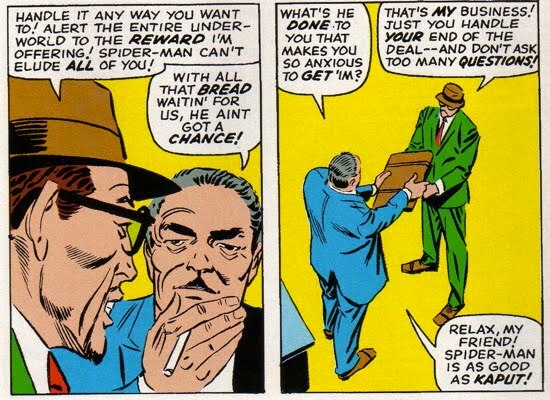 It's possible that artist Steve Ditko may have included Norman (or at least the character that would later be known as Norman Osborn) in the background in a handful of scenes from Amazing Spider-Man #2, #23, #25, #26, #27. 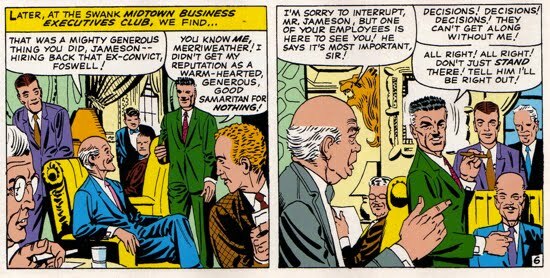 These cameos depict Norman as a member of J. Jonah Jameson's social group at his gentlemen's club (later officially named as The Century Club), a likely hangout for a wealthy industrialist like Osborn. Moreover, subsequent stories involving Osborn and Jameson have revealed that they were indeed members of the same club and that they had been associates for some time. Another important note is that the initial connection between Norman Osborn and Peter Parker is through Norman's son Harry, a friend of Peter's from Empire State University. Harry is first introduced in Amazing Spider-Man #31, along with Gwen Stacy, a future love interest of Peter. At the conclusion of Amazing Spider-Man #27, the Green Goblin claims that he is going to lay low for a while and wait for the best time to strike against Spider-Man. So its very ironic that when Norman Osborn is introduced into the Spider-Verse, his life is actually saved by Spider-Man! Amazing Spider-Man #37 features the criminal mastermind known as the Robot Master. And there is more to the Robot Master than meets the eye, for he is Mendel Stromm, Norman’s former business partner. The same man Osborn had arrested for embezzlement ten years before. The story commences with Stromm being released from prison and making good on his vendetta against Norman. He constructs a robot and sends it off to destroy one of Norman's electronics plants. Stromm is controlling and directing the robot while he remains safely in his laboratory. Spider-Man intervenes and stops the robot, but not after it completely destroys Osborn's property. One look at his destroyed plant and Norman is convinced that his ex-partner has returned seeking vengeance. Norman's next appearance comes in the subsequent issue, Amazing Spider-Man #38. Norman is featured only briefly in this story. However when we do see Norman, his personal vendetta with Spider-Man is still very much on his mind. After putting on a disguise, he approaches a gang and offers them a reward to finish off Spider-Man. He then pays them half of the money (literally, he's the cut the bills in half so that they are worthless until the job is complete). This initiates a wave of reward-seeking gangsters that attack Spider-Man. But Spidey has no trouble thwarting all of their attempts. Norman will soon resolve to handling Spider-Man himself, the only way to get things done right. The battle between the Green Goblin and Spider-Man is about to get personal. There are some interesting elements to Norman's earliest appearances in the Spider-Verse. At the conclusion of Amazing Spider-Man #37, Norman states that "Spider-Man must be dealt with." It can be implied that it was at this point that Norman decided he needed to raise the stakes with Spider-Man and thus uncover his alter ego (ie, the events of Amazing Spider-Man #39-40). However, that logic renders the whole bit with bribing gangsters to kill Spider-Man a bit wonky. And considering he's aware of his own alter ego as the Green Goblin, wouldn't he also already be aware that Spidey needs to be dealt with? Moreover, what was Stromm going to tell Spider-Man? Did Norman confide in him at some point and reveal that he was the Green Goblin? Did Stromm figure it out on his own? Or did Norman deceive Stromm and reveal the Goblin identity to be someone else like J. Jonah Jameson (similar to what he did with the Crime Master)? Why is somebody with the capabilities of the Green Goblin paying gangsters to handle his dirty work? Is it some kind of diversion? Occam's razor would suggest that all this confusion basically suggests that Norman was not intended to be the Green Goblin when he was first introduced. However, it is clear that there was an intentional mystique placed around Norman. For instance, the fact that he was able to fire at Mendel from that height must have required some super power, or perhaps a Goblin Glider. Goblin or not, Norman Osborn was certainly a shady individual. A shady individual who was beginning to develop an obsession with the wall crawler.